RENTON, Wash. – During a season that was all about trying to plug holes in the dike, the Seattle Seahawks quietly watched their most visible need get filled outside of the spotlight. 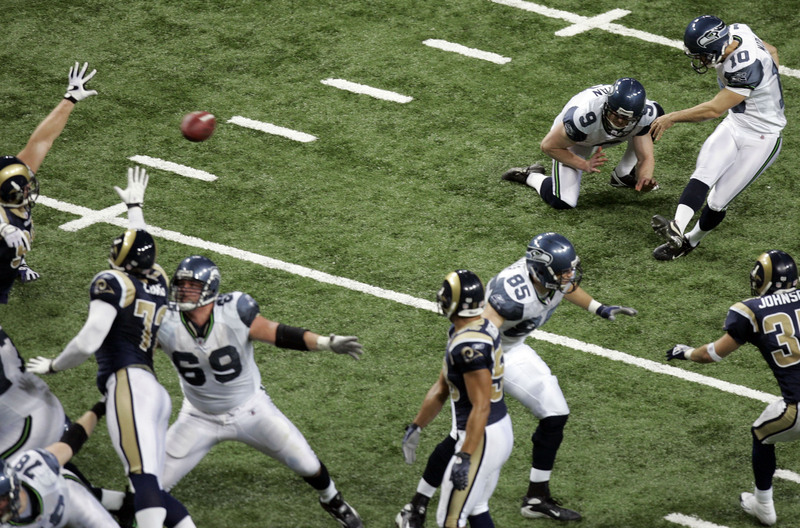 It was the Seahawks’ place-kicker – not receiver or offensive line or defensive end or quarterback – that was the team’s most glaring weakness entering the 2008 season. And Olindo Mare has made Seahawks fans forget the name Josh Brown, mostly by staying out of the spotlight. Mare had his first big moment Sunday, when he drilled a 27-yard, game-winning field goal as time expired to beat Brown and the St. Louis Rams 23-20. Leading up to that moment, Mare quietly did just about everything asked of him this season. And, quite possibly, Mare is the most valuable player on a team that has lacked star power. Not many teams would call the kicker their most valuable player, and yet the ’08 Seahawks have few other options. Tight end John Carlson leads the team with 51 receptions yet is a rookie. Cornerback Marcus Trufant, a Pro Bowler last season, has had a quiet season because teams have not tested him. Middle linebacker Lofa Tatupu has been slowed by injuries and hasn’t put up his typical numbers. The fact that the Seahawks had just one player named to the Pro Bowl on Tuesday, longtime Pro Bowl staple Walter Jones, accentuates the team’s dearth of healthy stars. An argument could be made that Mare was the team’s most productive player in 2008. While Jones earned his merit based mainly on reputation – he gave up five sacks in 12 games – Mare is having one of the better statistical years of anyone on the team. He has made 22 of 24 field goals, including 8 of 9 from 40 yards and longer. By way of comparison, New York Giants kicker John Carney hit 29 of 31 field goals on the way to being named as the NFC’s Pro Bowl representative. Mare also has 20 touchbacks this season, the second-highest total in the NFL. “I feel like I’m having a good year,” Mare said after Sunday’s game. “We’re all in this together,” he said when that prospect was raised after his winning field goal. Coach Mike Holmgren wasn’t naming any most valuable players this week, but he did have some good things to say about his kicker. Another surprise has been how quickly the Seahawks have easily accepted losing their kicker to free agency nine months ago.